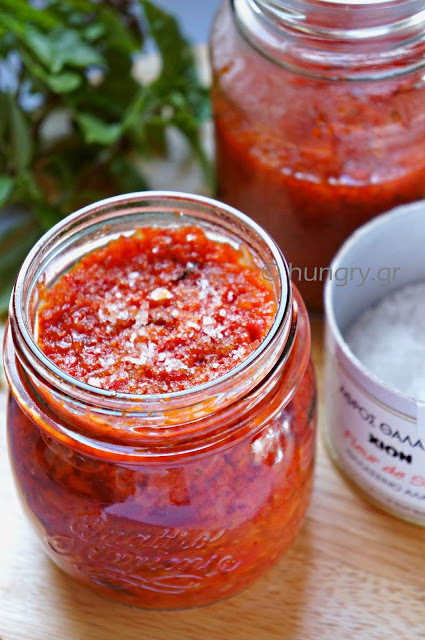 Tomato Sauce, classic, delicious and for varied uses, flavored with oregano and basil. 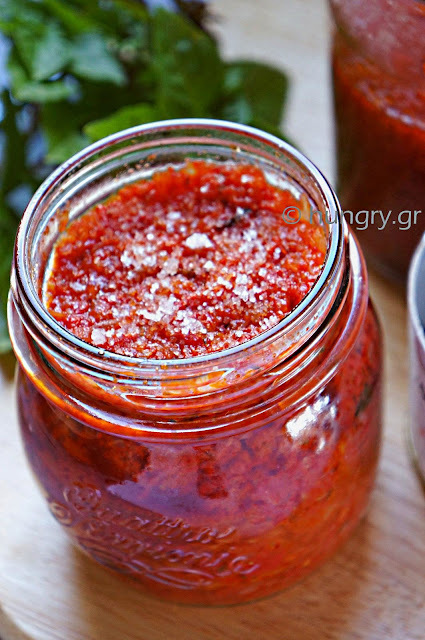 An easy sauce that accompanies perfectly meat and vegetable dishes. But also pizzas, bruschetta, sandwiches and of course pasta, any kind of pasta, where it takes off with its presence the flavor of the dish. 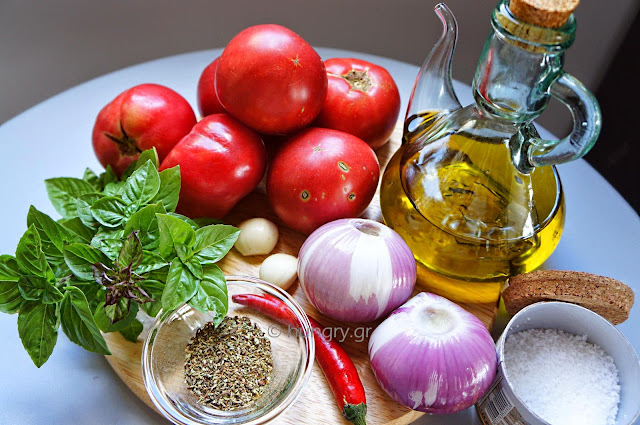 Tomatoes are rich in flavor, high liquid content, very soft flesh which breaks down easily, and right composition to thicken in sauce when cooked. 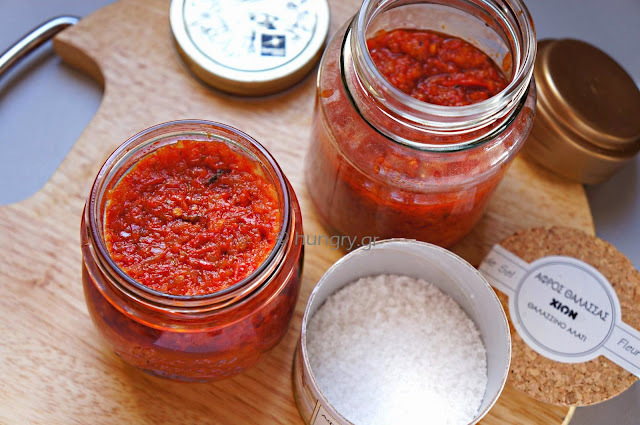 All these properties make it ideal for a simple and attractive sauce. 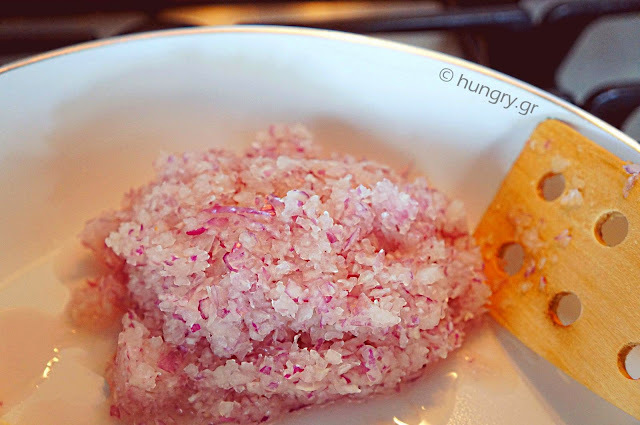 Peel, wash and mash the onions in a food processor. Put in a large pan on a medium to low heat. 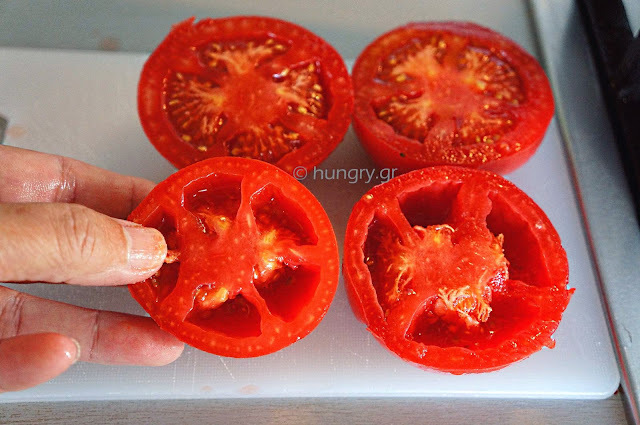 Wash and remove everything unnecessary there is of tomatoes. Cross-cut and plunging your thumb remove the seeds. …the chopped hot pepper, the olive oil and salt. Mix. 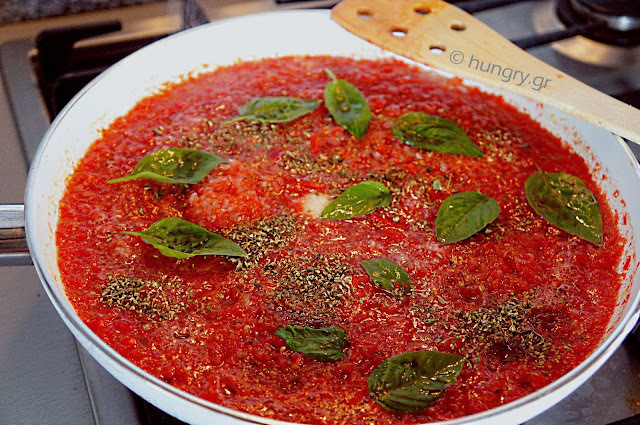 Sprinkle with oregano and add the basil leaves. Mix well and let the sauce simmer for 30'-40', depending on how dry we want it. 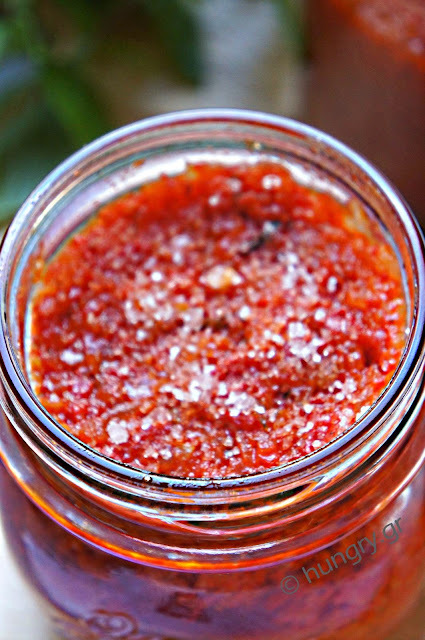 Fill sterile jars as the sauce is hot. Screw the caps and flip to cool. 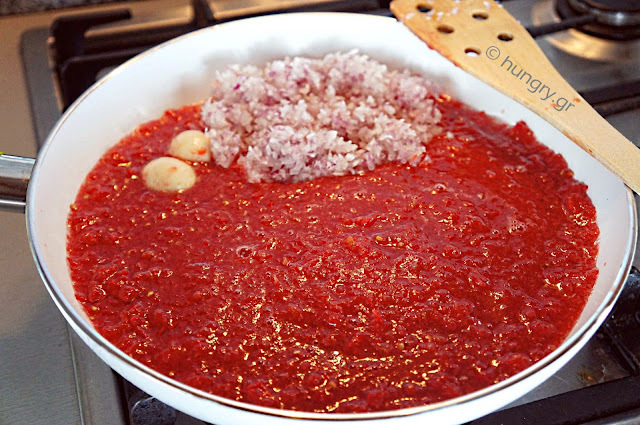 If you want the tomato sauce to have a velvety texture, peel and mash the tomatoes sauce with a blender, at the end of cooking and before storage. 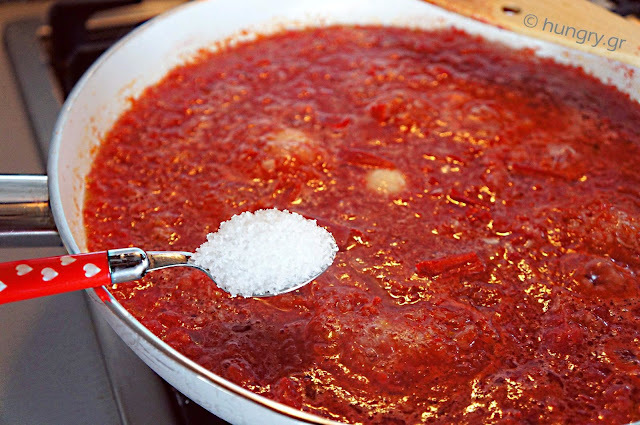 If the tomato sauce is to be used relatively quickly, within one or two weeks, it does not need to get into sterilized jars. Simply store in clean jars in the refrigerator. In that case add some coarse salt on the surface of the sauce. Spaghetti with a lot of tomato sauce, mint and kalamata olives. Simple, fast, tasty and filling for those who love, cook, and enjoy pasta with their friends, served with a glass of red wine or beer. Delicious spaghetti, which is very tasty even without cheese if you want a lenten dish.